Zooming in on some large icons caused incorrect image placement within the drawing canvas. When I zoom in (quite a bit) pixel placement becomes inaccurate. It occurs regularly with this icon. 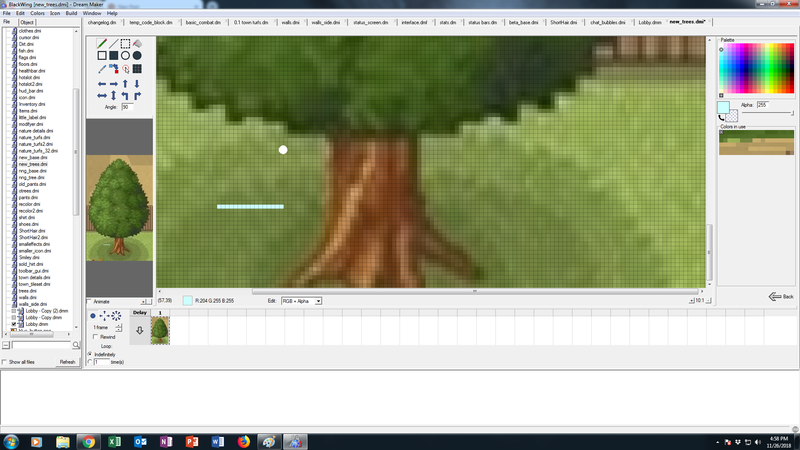 Keep zooming in until inaccuracies occur when drawing pixels. Inaccurate pixel placement at high zoom levels. Why are you stealing paid original art from my game tho? Shameless ripping. You should be banned. Yes, I clearly stole the tree and intend to use it in my next naruto dbz 2000 ultra 2.0 release. Don't you understand? This tree is VITAL to my plans for conquering the BYOND naruto fan game market. I simply MUST have it. The bug report is just a ploy for free marketing. Your mocking doesn't change the fact that you're literally trying to remove the background of a print of my game, ripping off the tree. It just makes you even more shameless, if that's even possible. The name of the file is even "new_trees", so you clearly intend to use it. I don't care which type of game you're making. They aren't free resources. You didn't ask and I didn't give you permission to use my game's icons, which are original and were bought. Attitudes like yours are the cancer of this community. Fortunately I actually found this issue the night before Thanksgiving, but it didn't have a report yet; the fix is ready to go for 1457. Your developing a naruto rip and getting whiny about "your IP" being stolen. This is fine irony. The tree is yours, or your artists, or the guy you stole it/bought it from. I really don't care. I'm just using it as an example for a bug. I don't need or want your tree. I was just test driving the new icon editor.